It's always strange what happens when you say yes to adventures. I constantly come across strange parallels whenever I decide to explore a place I've never been before. This time my adventure led me to a lesser developed island in the Bahamas called North Eleuthera. Other than knowing my love for remote, untouched beach landscapes with crystal blue water, I wasn't sure what else I would latch onto here. Boy, was I in for a surprise. I arrived at the tiniest shack of an international airport I've ever seen where people wait outside on chairs for the plane to arrive and then was whisked off to The Cove Eleuthera, a pristine white on white hotel that sits on a gorgeous stretch of the Caribbean. Upon arrival it felt strangely familiar. Maybe it was the way the pink sand beach coves ebbed and flowed with the cliffs like the beaches I knew in Sydney when I lived there or perhaps it was just the ocean that I missed so much after spending a few steamy weeks in beachless New Orleans. Ah, New Orleans. That's it. The white shutters along the buildings in the property reminded me of the giant white shutters I have in my home here instead of blinds, and as I sat to eat my first meal here beignets were on the menu. What a strange coincidence. It seems New Orleans follows me everywhere I go. Later I find out that the property was bought and developed by the man responsible for successfully cleaning up New Orleans after Katrina. 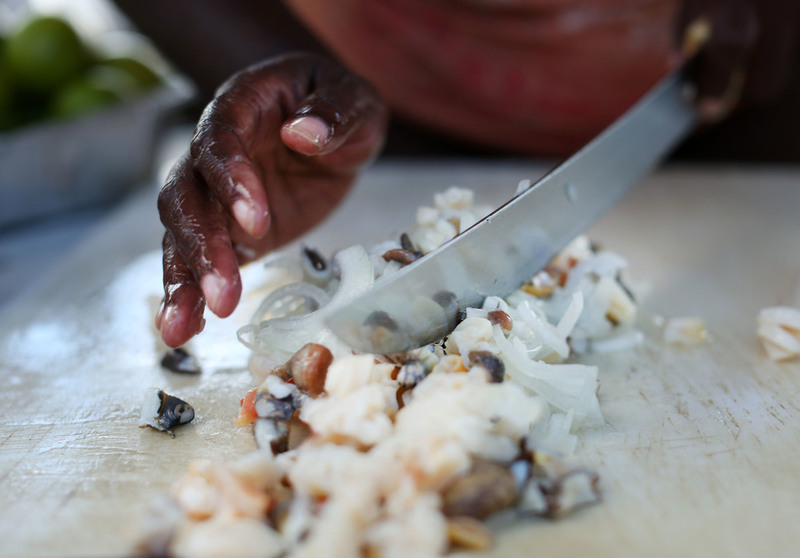 His love for New Orleans followed him everywhere, too, even to the remote island of Eleuthera. It seems the heart actually can be in two places at once. It's part of the reason why I love Nola, because the people here think outside of the city and constantly find new places that share the same vibe and share influences. Ask Lenny Kravitz if you don't believe me. He bounced from New Orleans to owning a huge piece of land on the island right next door to this hotel. I just love when these connections happen. It's a sign that I'm on the right path and surrounding myself with the right things. The thing about this place is that it begs you to do absolutely nothing at all. It's not filled with things competing for your attention or things that cater to the tourist. The Bahamian vibe is accepting, truly laid-back and appreciative of what their gorgeous piece of earth gives them. A great example of this is in the food. No acai bowl bars, no fast food places, just fresh catch of the day. 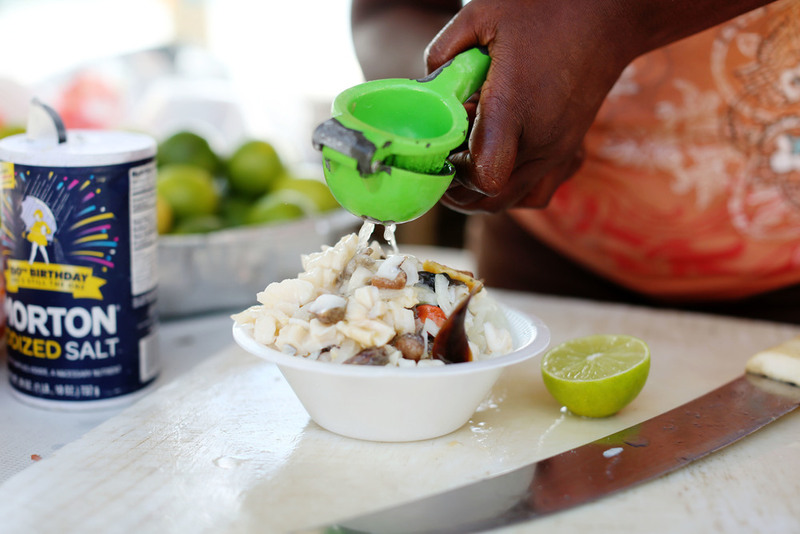 I hung around a little tent selling fresh conch salad and watched a local order her favorite dish. For one of the other girls on the trip with me, they gave her one filled the meaty white part of the conch served with colorful peppers and tomatoes putting together something insta-pic worthy. For the local, she used some of the darker bits which were basically the eyes, mouth and brains of the poor little guy and as she cut it up and put it in the bowl it was still moving. True sea to table! Chewing fresh conch apparently keeps the teeth strong and clean, according to the locals. Who needs a dental plan! Now for the spiritual side, aside from my epic Bhutanese massage, the land here is also sacred. Marianna and I trekked over to the Queen's Baths, an area along the Atlantic side where water laps rhythmically into tide pools that warmed by the sun. There was not a single other person here when we were here; just the sound of the waves, a few sea urchins and a school of nemo fish. We had no ride home and our driver advised us to just start walking and someone will pick you up! Hmm. We actually did start walking along the road and within minutes a white truck pulled next to us offering us a ride. It turns out it was Lenny Kravitz's property manager who was friends with the GM at the hotel who showed us Harbor Island earlier in the day. We successfully hitchhiked like a true Bahamian. I'll leave it here again, for fear that no one has the attention span to keep listening to me babble about beautiful places. I have a few other tips on things to do but I'll break it up a bit. More soon!